Ride along with Chicago florist Flowers With Feeling, Inc. as they design and execute floral and décor services for weddings and events at some of Chicago’s best known venues including the Chicago Yacht Club, Saint Josephat Church, the Palmer House Hilton, Wyndham Hotel Chicago and Café Brauer in Chicago’s near north Lincoln Park neighborhood. Featured wedding and event decor locations also include the Donald E. Stevens Convention Center, Drake Hotel Chicago, Chicago Hilton and Towers and Westin Chicago River North. Subscribe to the Flowers With Feeling blog by email or in reader (RSS feed) for future editions of “on location videos”, Chicago floral, wedding and event décor features, ideas and trends. “Customers who visit Flowers With Feeling’s website, www.flowerswithfeeling.com, get to see more than run-of-the-mill bouquets and contact information. For more than a year, owners Jeff and Tammy Warden have been turning to video to promote their Chicago store, a move that has helped them better educate their customers, improve their search engine results and have a little fun. After they shoot a video, the couple uploads the file to a third party host, such as Yahho Video ( http://www.video.search.yahoo.com) or Revver, and imbeds the file in their site after “tagging” the video with pertinent key words such as “Chicago”, “wedding” or “centerpieces.” To reach a wider audience, they also post the videos to http://www.YouTube.com. So far the Wardens have created three videos, including a behind-the-scenes look at a wedding at the Drake Hotel. In the future, they would like to post videos weekly, on a wide range of topics. -View Flowers with Feeling videos here. -View Flowers With Feeling photo gallery here. Flowers with Feeling, Inc. is proud to have been selected to provide floral services for the 90th Annual Lions Clubs International Convention 2007 held at various locations throughout Chicago. Since 1917, Lions Clubs International has fulfilled the needs of communities in need throughout the world. For more information about Lions Clubs International visit www.lionsclubs.org. Flowers With Feeling has provided floral and plant rental services to many of Chicago’s best known conventions groups since 1986. Lions Clubs International Convention brought together 18,000 members for a week of meetings and events at locations throughout the city including McCormick Place, United Center, Sheraton Chicago Hotel, Oakbrook Bath and Tennis Club and Hyatt Regency McCormick Place. Floral decor requirements ranged from casual to formal for groups of 70 to more than 1800 and incorporated a wide range of design styles, color pallettes and floral selections. For more information about Flowers With Feeling convention services or to schedule an appointment, please visit www.flowerswithfeeling.com or call 312-829-1141. The John G. Shedd Aquarium Chicago is an extraordinarily unique venue which offers an engaging and inspirational atmosphere for private corporate and social events. Dimly lit galleries feature rare and exotic aquatic species give the Shedd Aquarium a certain charm and character unlike any other Chicago special event venue. The Caribbean Reef ,centrally located in the Grand Rotunda on the main floor, boasts a 360 degree view of an under-water reef community. 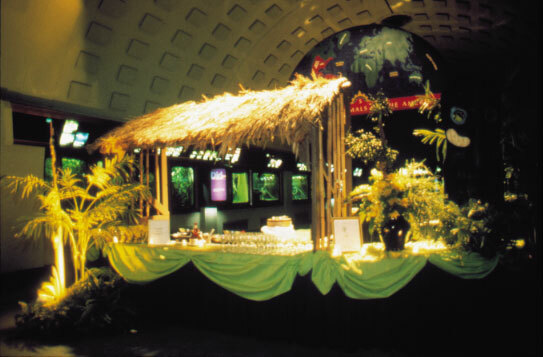 Typically the hub of many special events at the Shedd Aquarium, several galleries radiate from this center point and offer additional seating for larger events. Each gallery presents a one of a kind dining experience enhanced by surrounding exhibits. Buffet style service is common and allows guests to stroll and mingle among the exhibits. The uniqueness and charm of this Chicago venue makes large scale events feel quaint and personal. The aquarium can accommodate up to 1200 guests for a reception and 550 guests for a seated dinner in the Caribbean Reef Rotunda and adjoining galleries.In addition to the Grand Rotunda and surrounding galleries, the Shedd Aquarium offers the unique opportunity to hold your event on its outdoor terrace which offers breathtaking views of Chicago’s lakefront, Grant Park and Navy Pier. For more information on the John G. Shedd Aquarium visit www.sheddaquarium.org. For floral and event decor ideas, photos, videos and more visit www.flowerswithfeeling.com or call 312-829-1141 to schedule a free consultation. Whether planning a simple event, wedding, bar mitzvah or grand gala, or simply sending an arrangement (shop online) to someone special, Flowers With Feeling will strive to exceed expectations…Chicago’s full service florist since 1986.